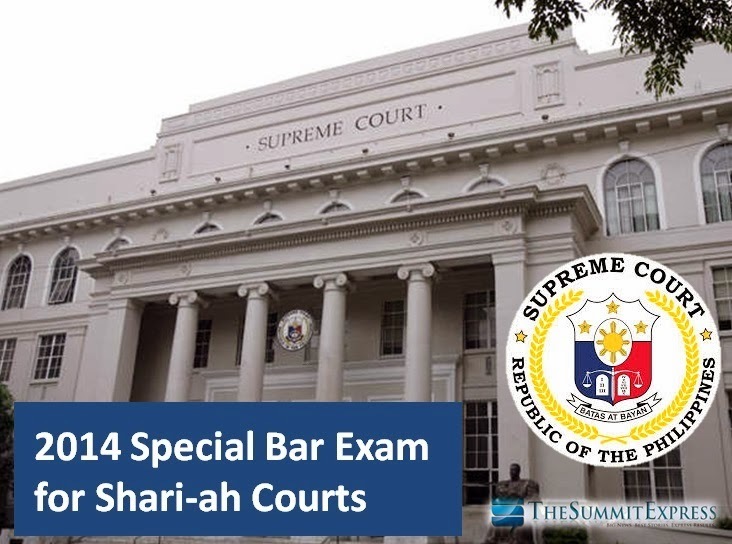 Manila, Philippines - The Supreme Court (SC) today, February 24, 2014 released the results of January 2014 Special Bar Exam for Shari-ah Courts. 125 out of 267 passed the exam through the Office of the Bar Confidant (OBC). The complete list of passers and top 10 are now posted online. Bin Usman Imam, Luqman L.
The top 10 passers are: Pandi, Edna P. (90.3%); Sinsuat, Indira I. (87.8%); Bin Usman, Imam Luqman L. (86.65%); Maulana, Princess Joy M. (86.55%); Tagtagan, Shahani Muhaymin B. (86.2%); Kabalu, Hajar U. (86.15%); Lacoto, Norjanna T. (85.8%); Mabang, Eshan Karl O. (85.75%); Ali, Mohaimen U. (85.45%); and Sultan, Abdelghani C. (85.3%). The Shari’ah Bar exams were conducted on January 19 and 26, 2014 at the Court of Appeals, Maria Orosa Street, Manila. The exams were administered by Judge Kaudri I. Jainul, Chairman of the 2014 Committee on the Shari’ah bar Examinations, with the following members: Prof. Macrina Morados, Persons, Family Relations and Property; Atty. Melchor Rey K. Sadain, Procedure in Shari’ah Courts; Judge Samsodin A. Mustapha, Jurisprudence (FIQH) and Customary Laws (ADAT); and Judge Montano K. Kalimpo, Succession, Wills/Adjudication and Settlement of Estate. Ma. Cristina B. Layusa, Deputy Clerk of Court and Bar Confidant announced that the oath-taking ceremony of the successful candidates will be held at 2 p.m. on March 11, 2014 at the Session Hall of the New SC Building in Faura, Manila. The successful examines are required to secure their clearance from the OBC from today until March 10, 2014. The successful examinees who were conditionally admitted to take the examinations are also required to complete their remaining requirements. Likewise, they are required to prepare P1,000 for the oath-taking fee and P100 for the Certificate of Admission.